Forsaken World is a fantasy MMORPG published by Perfect World Entertainment that has been around for quite a few years now (China 2010, Europe/NA 2012). We’ve dipped in and out of the game to check new updates when they have been released, but we decided to commit a little time to the game and see how well this title hold up. Returning to the world as the Demon race and the Tormentor class (locked to this race) we ploughed through the game up to level 30 to see what we thought. Not much as it happens. Whilst the number of classes and races available isn’t too bad (though still on the low side for a game that has been out for nearly 3 years in the West) and the character customization is far from the worse, when you get into the game it’s generally pretty downhill. The game just looks bad; graphically, it leaves much to be desired, and this is AFTER a graphical revamp from a while ago. Bad GUI, bad/blocky/flat textures… all of which might have just about held up for 2012, but at the cusp of 2016 there’s just far superior MMORPGs out there. It doesn’t stop at graphics though, we’re fine with games not looking their best, but they have to make up for it in other areas and Forsaken World just doesn’t. Starting out you’ll be questing, as is typical for an MMORPG, and we started our journey in the “Land of Origination” that by the time we reached the end of it had taken us up to level 30. Had taken a good few hours, and where we ended our playtest. It was a pretty boring 30 levels consisting of mediocre storylines, annoying bugs, tedious combat and a complete absence of features. The questing for this time was extremely linear, get a quest, complete a quest, get the next quest, for thirty levels… I mean we kind of expect this in most MMORPGs (particularly Asian cookie cutter MMORPGs that all seem the same) but making us go through this kind of gameplay for thirty levels was pretty ridiculous and not to mention very very dull. Insult added to injury is that the quests themselves were pretty grindy having to kill so many enemies for some quests, thankfully (if we had built it up) we had our “Wraith Surge” which instantly killed everything under level 30 within 10 meters, but it wasn’t always the case that we did. The areas went through a constant transition of long journeys where there was nothing to fight and then suddenly hundreds of the same enemy crammed into an area for players to kill. Once upon a time this may have been needed if the population was higher so that players could complete quests (as the enemies respawn after a couple of seconds), but we only saw one other player in our entire experience. Combat itself was fairly lacklustre, we’d stand in the middle of the mobs we needed to kill (as none of them were aggressive towards us, even if the lore/quest seemed to dictate otherwise) and just spam our attacks, hit tab, spam again, hit tab where it would usually just target an enemy that respawned where we killed the first. At level 20 we opened up the “Solo Instances”, in the middle of a quest chain we thought we’d check it out and were instantly teleported to a new location where we had to prove we were good soldiers. In quite a novel way we had to practice getting into formation with other soldiers, they would run around a parade square and then get into a formation leaving a single position that we needed to get to within the given time limit. It was interesting the first time, second time not too bad, but we had to do it 5 times… then we had to fight a soldier, with two NPC allies helping us who were tanking and healing, we had to kill the soldier Initiate within 60s. Done, no problem. Then there was another initiate we had to fight who was a little tougher… then another… then another… then another… The fights were boring, they attacked the tank and we stood there and spammed attacks, they were so boring that we just decided to leave the instance and decided to carry on with our questline. Unfortunately our teleporter didn’t return us to where we left off and instead took us to a completely different location, and then we had to teleport back to the beginning of the starter zone and run back to our quest location for about 5 minutes… The one moment that made it worthwhile was picking up a quest to go and kill a boss type mob that couldn’t be damaged without a quest item that would one hit kill him, when we approached someone else was attacking him, throwing everything they had at him but doing no damage (luckily the mob doesn’t do much damage back). We watched for a few minutes and then when he stopped and looked at us, we used the item and one hit killed him and we were greeted with a “… what the hell.” from the player, to which we bowed and ran off! The highlights, unfortunately, were few and far between and instead the annoyances were more commonplace; little things like invisible walls blocking off areas, particularly at a cliff hanging over a fiery pit where we got curious about jumping off… well the developers decided to put that particular invisible wall a little down the mountain so that we got wedged and couldn’t get out and had to hearth/town portal back to the beginning of the zone again. Stuff like reaching an area where guards were fighting goblins, but the spawns were so random you had guards fighting thin air, or guards facing guards so they looked like they were fighting each other. The soldiers in the parade ground when getting in formation would move with a walk animation, but actually moved at a much fast pace so they just looked like they were gliding along the ground. Things like this are just weak in an MMORPG and completely off putting. Is there fun content in the game? Probably. Will the endgame have more interesting features than we could experience? No doubt. The problem is that an MMORPG should grip you from the beginning with… something… anything... not put you through dozens of levels of boring stuff and still expect you to want to play. 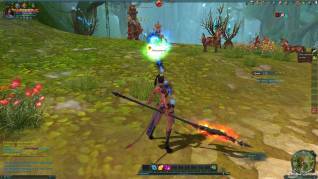 One Comment - "Forsaken World Review"
Don’t waste your time on this broken pos game.